Gayle teaches knitting classes around the country, with a focus on using Japanese patterns. She loves to introduce knitters to the pleasures of Japanese designs, and her knowledge of the subject is unmatched. In a previous life, she was a management consultant who sold and managed multimillion-dollar economic development projects around the world, especially in Asia. She lived in Japan and speaks Japanese. After returning home from Singapore, she started a business importing traditional Japanese and Indonesian fabrics to the U.S., until her parents needed her full-time. She turned her love of knitting into a second career, teaching and writing with a focus on introducing western knitters to Japanese designs and unusual stitch patterns. Her article about Japanese knitting appeared in Knitter’s Magazine in 1997, and was among the first information to appear in English on the topic. She prepared the Japanese section of the book Knitting Languages, and for some time she was the translator for Dancing Fibers, importer of Diakeito yarn. Now that Japanese books and magazines are readily available online, Gayle has been teaching knitters across the country how to understand and enjoy these intriguing designs. 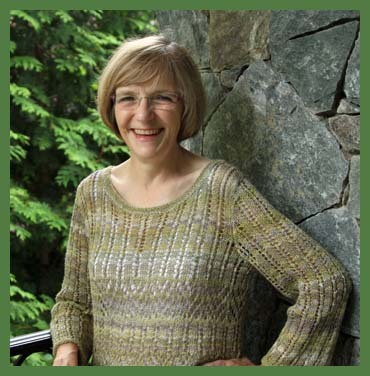 She has taught for Stitches events, Interweave Knitting Lab, Madrona Fiber Arts Retreat, Maryland Sheep and Wool Festival, Vogue Knitting Live, Knitter’s Connection and numerous other national, regional and guild events. Her designs for garments and accessories have appeared in Knitter’s Magazine, Interweave Knits, A Gathering of Lace, and for yarn companies such as Jamieson & Smith. She is a member of Potomac Fiber Arts Gallery in Alexandria, VA, where she sells her original handknits. © Gayle Roehm 2014. All Rights Reserved.